Metropolitan Home Health brings smiles. Fluffy Comfy Caps provide warmth, comfort and a splash of color. 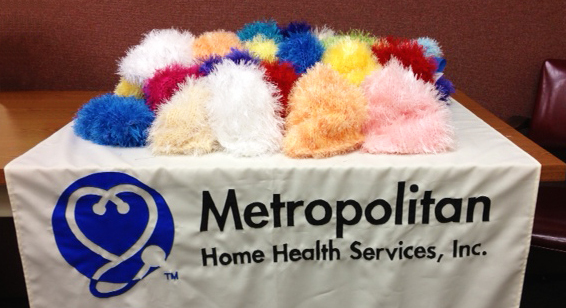 Metropolitan Home Health Services, Inc. donates its colorful handmade Fluffy Comfy Caps to facilities and organizations that help individuals who are undergoing chemotherapy treatment. 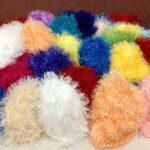 Fluffy Comfy Caps are one size, made with “Fun Fur” and come in a wide range of colors from natural to a choice of bright fashionable colors depending on the wearers preference. The Fun Fur yarn provides a softness that is very comfortable to the wearer. Its soft feel gives warmth for sleeping or for wearing out. Fluffy Comfy Caps are lightweight and provide a nice alternative to wigs and scarves. Fluffy Comfy Caps have added to the lives of those who’ve worn them. This entry was posted in Tips and tagged Comfy Caps, elder home care, elders, stay warm, tips. Bookmark the permalink. Comments are closed, but you can leave a trackback: Trackback URL.